Lake Hlaalu Retreat is a lakeside camp located in western Deshaan, just north of the town of Narsis. 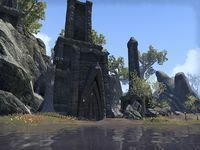 The retreat is located next to Lake Hlaalu, and is home to a special crafting site, where you may craft items in the Torug's Pact set. A number of Centipedes, Rats, and Scrib can be found here, offering a moderate source of Crawlers and Guts.